Watching a flock of starlings twist and loop in the sky or a school of fish writhe and turn in the ocean, one has to stop in wonder. How does a group of thousands join together to approximate a ribbon twirling in the wind? How do they not constantly jostle each other? Mathematicians, computer scientists, and biologists have studied and modeled flocking behaviors in animals for decades. 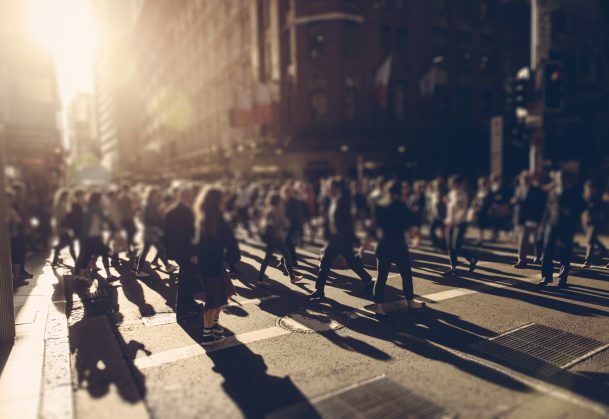 In a new article in Current Directions in Psychological Science, cognitive psychological scientist William Warren of Brown University details his work over the past 15 years to describe crowd movements in humans. move away from those that are too close to them. move toward those that are far away. match the direction of the movement of their neighbors. Models based around these rules have already borne fruit in Hollywood, Warren writes. The realistic wildebeest stampede in Disney’s The Lion King and flocks of bats in the Batman movies were all modeled with them. The answers to questions like, “Who do we consider ‘neighbors’ in a large crowd?”, “How close is ‘too close’?”, and, “Do humans keep track of neighbors within a given proximity or a specific number of bodies in a crowd?” are not objects of mere curiosity. These factors show up when a “crowd of pedestrians adopts a common motion on the way to a train platform or forms opposing lanes of traffic in a shopping mall,” Warren notes. In this way, understanding human motion might help architects or city planners design spaces for crowds to move more efficiently. “Collective behavior can also go tragically awry, such as in a stampede in a stadium or a rush to one exit in a burning nightclub,” Warren adds. This research has advanced enough to produce a model of how humans move in a crowd. In 2003 and 2008, Warren and Brett Fajen of Rensselaer Polytechnic Institute started their motion studies by watching how one person moves around in a virtual reality environment. They tracked how people move toward their goal locations and avoided obstacles. The model they created showed that human movement toward goals is like a stretched spring, pulling people toward where they want to go. But movement around obstacles is a compressed spring, pushing them away. The researchers then looked at a small crowd. In 2014 Warren and other cognitive scientists asked study participants to follow one other person in a virtual hallway. They found a similar ‘springy’ attraction between two people. The experimenters also noticed that the follower tended to match the leader’s speed and direction changes but didn’t keep a constant distance between the two walkers. Since 2016, Warren and his collaborators have been mapping the interactions between larger crowds — 16 to 30 people moving around a virtual space. They found that humans in crowds have a “neighborhood of interaction”: they pay more attention to their closest neighbors — those within 6 feet or so — and less attention to the farther ones (11-12 feet away). A person will often ignore the movement of a neighbor who is more than 16 feet away. Studies on starlings suggest that the birds keep track of a certain number of neighbors as they fly, rather than keeping tabs on all neighbors within a certain distance. By varying the density of neighbors in a virtual reality simulation, Warren determined that humans, unlike starlings, tend to focus on a particular radius rather than a given number of neighbors. However, that distance is not fixed or regular. Through their latest investigations completed in 2018, Warren and his colleagues found that the neighborhood of interaction in human crowds around a person can expand and contract in a donut shape. There is an immediate radius around a walker where they monitor neighbors and attention gradually decreases (the donut hole). This is surrounded by a ring in which attention drops off rapidly (the donut itself), and then decreases to zero at around 16 feet. So whether you recognize it or not, when you’re walking around the mall or on the sidewalk, you carry a meters-wide donut around yourself, avoiding people humans who are too close, gravitating toward those who are too far away, and matching the direction of everyone your donut holds.